If you've followed me for a while you'll know already how much I adore the summer time, it's everything. I love early mornings in the summer, sitting outside munching on some fresh fruit for breakfast with an iced coffee with Phil and our little Daisy running around our feet playing with her toys... it's the little things which make me so happy. 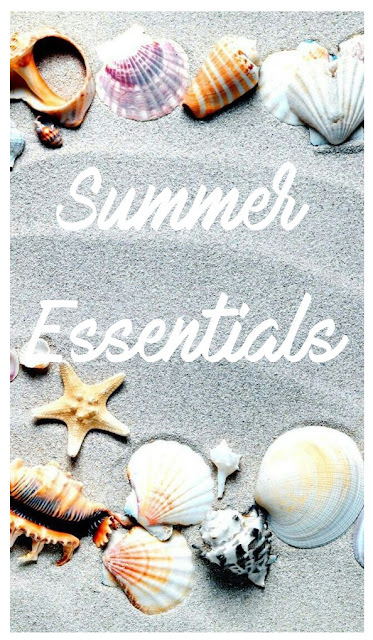 Since Summer is now here I thought I would share with you 'My Summer Essentials'. I'm unsure on how many people know this but I'm actually on chemotherapy tablets and because of this little fact, it means I can't sit in the sun for too long and also means when I do I have to make sure that I wear A LOT of sunblock, so this is a massive essential for me. Another massive must for me to keep the sunshine at bay... essentially on days outs in the sunshine. Because I'm in my wheelchair when I go out the sun really hits the top of my head and causes terrible headaches if I don't wear a hat. Having bright coloured lips and nails in the summer is amazing. I adore trying out new colourful makeup looks and nail art when the sunshine is here. I love sunbathing with a cold glass of lemonade with lemons in one hand, a great book in another hand and some awesome music playing in the background. No better way to spend a lazy afternoon. Suncream is by far my biggest essential, it makes your makeup look stunning too! Although I haven't read a word from either of my books on holiday but I do enjoy sitting in the sun with a book and a cocktail! Suncream and lip balm so my lips don't dry out! Great ideas. Definitely the lemonade!! But suncream and a good lipbalm are essentials. I also have prescription sunglasses which I absolutely love as it means I don't need to wear my lenses! A cold glass of lemonade is also a summer essential for me, this has really made me crave a glass, even on this dull and cloudy day in Oxford! I love a wide-brimmed hat too, a sunburnt face is the worst!! oooh! I can't wait to get a wide-brimmed hat for summer this year. Ice cold lemonade with REAL lemons sounds like summer perfection to me! Fresh Lemonade is perfection in the summer! I can totally relate to the summer love! Early mornings and light evenings make me so happy. Agree with this list totally! I love brightly coloured lips and nails for summer! My essentials probably include a nice half up half down hairstyle to keep my hair out of my face! I couldn't go out in the sun without sun cream. I'm so ghostly pale that I burn so quickly! I love the sound of the last one on the list - lemonade and a book sounds perfect! I love bright nails in this season!! Every single thing you just mentioned... PLUS cocktails, cocktails & more cocktails! Mine are pretty similar! But also sunglasses and maybe a camera if I see nice flowers or things to take pictures of!! I like the idea of drinking lemonade and iced coffee, I really want to try iced coffee! I had raspberry lemonade recently and it was delicous!